It is 31th December 2018, the last day of 2018, people from near and far, local Kuching people and international tourist, all gather around the Tourist Hotspot of Kuching – the Kuching Water Front. Near the main Bazzar and the Square Building, there are stalls and performance stage being set up. New Year Countdown 2019 and Launching of Visit Sarawak Campaign banner at the entrance. Local artist are invited for singing and dancing performance at the performing stage near the infamous Darul Hana Bridge. People gathers around the venue and enjoy the show, despite there is occasional downpour and drizzle. The event is also broadcast live on social media. There are many LED screen been set up along the waterfront with live footage from the stage. Visitors can witness the event even without being close to the stage. There are two stage at the event. The public stage is where the artist singing and dance performance throughout the day, and the Grand stage is the open performance floor at the VIP canopy. The Grand Stage overlooks the Darul Hana Bridge, Musical Fountain and the State Legislative Assembly building. Stage performance at Kuching Waterfront. The Darul Hana Bridge had been closed for three days prior to this event, giving way for the preparation of the Fireworks display and light show. This is the second time where is bridge is lit up with amazing fireworks. 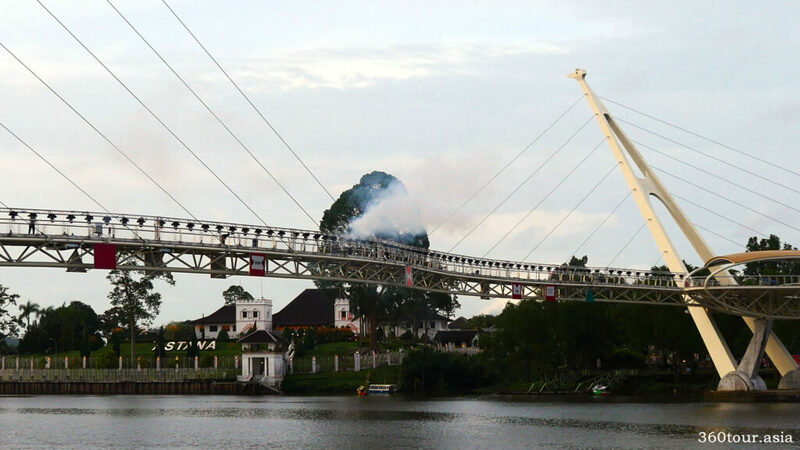 Darul Hana bridge is the symbol of unity with two majestic suspension towers featuring a overlooking hornbil on both side of Sarawak River. It is a landmark not to be miss. The Preparation of the Darul Hana Bridge for the night. Thousands of people waiting anxiously for the highlight of the event – the countdown and fireworks. Heavy downpour and rain did not stop the public from standing under the rain. Two hours before the countdown, everyone had book their perfect viewing spot beside the waterfront. Light show under the rain. The heavy rain and wind distrupted the water screen performance, however the light show remains amazing under the rain. The 3D lumination of the DUN attracts most of the initial attentions as it is the first of its kind in Sarawak. This is the first time many locals sees the amazing 3D lumination of the DUN. Colorful lights and image been projected from a three storey tall light projector set up at the waterfront. It tells a story of Unity in Diversity of Sarawak. It also marks the launching of the Visit Sarawak Campaign of 2019. Amazing 3D light show at the DUN building. The light show continues into the countdown to 2019. With the shout of countdown to 2019, amazing colors lit up the DUN. The New Year Countdown Lightshow. The New Year Countdown 2019 Light show. After the countdown, the next event highlight is the freworks. The fireworks lit up from the Darul Hana Bridge, in sync with the musical beats. It is also the first Musical Synced Fireworks in Sarawak. Several famous music accompany the fireworks display. Fireworks at Darul Hana Bridge. The Grand Finale of the Fireworks at Darul Hana Bridge. After nearly 15 minutes of fireworks, it had come to the end of the event. Everyone left the ground with wet cameras, wet handphones, and a happy wish for the new year. Happy New Year 2019 !